When you hear the term ‘paperless dental office’ you may literally imagine an office void of paper charts. But the beauty of the paperless office is obviously more than just the absence of clutter. A true paperless system changes the actual workflow of your office. Imagine a world where data is only touched once. Errors are caught and corrected once. Patient information is available from anywhere at any time. Imagine anyone in your office instantly having access to the information, images, or files regardless of who is currently working on that file or where the patient or staff currently are. The benefits of a paperless office are a no-brainer. Security issues are reduced when you don't have to worry about managing, storing, and destroying paper records. Your staff saves countless hours on data entry, duplicated work, correcting errors, and even the aforementioned storage and destruction. When you use the right system, you also can benefit your patients: they'll save time and have more efficient appointments because your staff isn't bogged down by paper. What about the security of a paperless office? Unfortunately, the truth is losing electronic information is the same as losing it on paper. In fact, stealing 5,000 records stored on a hard drive is even easier than stealing 5,000 paper charts! The only real solution is to go paperless and then put all that info in secure servers in the cloud. With this solution, you don’t have anything to steal in your office. Everything is secure in the cloud. This is the same system used by big banks, government agencies, and more. Some of the most security-conscious industries use cloud storage to ensure both access and security. tab32 is fully HIPAA compliant and secure. We know the benefits of a paperless practice only extend to how convenient and secure your records are. Learn more about our security here, then be sure to schedule your demo. 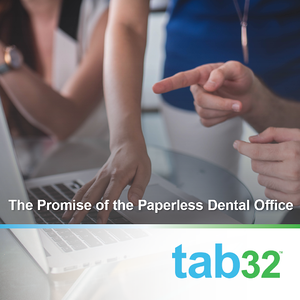 We'd love to show you how easy it is to be completely paperless in your practice.